Sometimes I hit CTRL+ENTER or ALT+S by mistake and off goes the message as it is Outlook’s shorcut for the Send button. I think most people can relate with you; getting tangled up in pressing Enter to start a new line and hitting CTRL instead of SHIFT when trying to capitalize your new line or pressing ALT+S instead of CTRL+S to save your draft. You can prevent this from happening by not addressing the mail yet although this might not be practical, especially when replying to an e-mail. Luckily Outlook allows you to configure what happens when using CTRL+ENTER but to disable the ALT+S keyboard shortcut, you’ll have to edit the Registry. Outlook should always send the message (select the box and press Yes). Outlook should never send the message (select the box and press No). 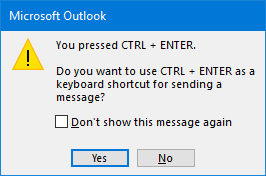 Outlook should always ask you what to do (do not select the box and choose Yes or No). Not 2 but 3 choices are available here. When this key is missing, Outlook will behave as if its value was set to 2. Note 1: The value name (AltS) is actually irrelevant for this particular key but it is good practice to use meaningful names. Note 2: If you are not very into editing the Registry, then there are also other ways not to have emails send directly after giving a Send command.